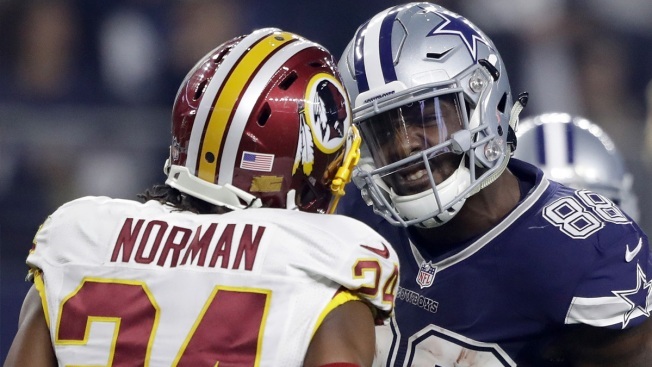 Dallas receiver Dez Bryant and Washington cornerback Josh Norman professed their respect for each other before their first meeting in Week 2. The good feelings were gone by the end of Round 2, which nearly turned into a fight. Bryant and Norman had to be separated after the Cowboys' 31-26 victory Thursday, which included several testy moments between the Cowboys' 2014 All-Pro and the free agent who signed a five-year, $75 million contract in the offseason. "Tell Washington to get their money back," Bryant yelled at reporters on his way into the locker room before repeating it prior to the first question in his postgame interview. During the game, Bryant was most upset when Norman grabbed his leg after a tackle on a catch in the second half. But the jawing started early, after Bryant's first catch early in the second quarter. Bryant's longest reception was a 26-yarder against cornerback Kendall Fuller to set up the Cowboys' final touchdown for a 31-19 lead in the fourth quarter. After the game, the players were facemask-to-facemask for several seconds before Bryant's teammates stepped in. Bryant grabbed Norman's facemask and Norman swung in his direction and threw a towel at Bryant as he was being pulled away. "That guy is soft man," said Bryant, who had a team-high 72 yards on five catches. "He is really soft. He's supposed to be a lockdown corner but you can't even play man-to-man." Norman was asked about Bryant's claim that he "exposed" the former Carolina player before a Washington spokesman whisked Norman away. "I've played him three or four times now," Norman said. "And those times I don't think he broke 30 yards. Or had any significance on any kind of game. But at the end of the day, I will let him speak for himself. If he feels like he wants to have that, then go play with the kids on the playground." Norman ended up with the Redskins after Carolina surprisingly rescinded a contract offer under the franchise tag in the offseason, making him a free agent. He didn't get to cover Bryant until late in the first meeting, a 27-23 Dallas victory that started its franchise-record 10-game winning streak. Bryant had seven catches for 102 yards in the first meeting. "He got frustrated," Bryant said. "I feel like, if you're going to give fire, you better be able to take it. Because if you get me rolling, I'm not stopping. Bryant, who has had some volatile moments in his career, was asked what would have happened in a similar postgame incident earlier in his career. "I would have beat him up," Bryant said. "Right on the field. Straight up." Dallas coach Jason Garrett said he thought Bryant handled the matchup with Norman well. "You are going to play against certain guys that are going to try to get you off your team and distract you," Garrett said. "I keep using the word focused, but I thought he was focused throughout this ballgame." Bryant took to Twitter not long after the game to criticize Norman again, responding to a follower by writing, "Boy stop ... go watch the film.... the man can't cover one on one... I broke him down on so many routes tonight." But Bryant was more reflective about the incident a couple of hours later, tweeting, "I just finished watching my interview on espn ... I shouldn't have even stooped down to that ... we have something special here in Dallas." Redskins coach Jay Gruden said he didn't see the postgame exchange. "And I don't care," Gruden said. "Those two guys are great competitors. Both of them are great players and I'm sure I'll read about it on Twitter."